The Enjoyment of Theatre’s balanced coverage of performance and history provides a comprehensive and accessible introduction to theatre for both majors and nonmajors. This text establishes the aesthetic underpinnings of theatre art and then explores performance and production topics such as playwriting, acting, directing, design, and the theatre industry. 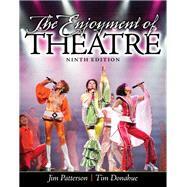 The Enjoyment of Theatre also covers the full span of theatre’s 2,500-year history. The authors make theatre come alive for students by showing them how theatre is relevant to their everyday lives.